I was torn between two recipes for the latest cookbook swap page. One was fast, the other took time, but both resulted in a fabulous slice of carbohydrates and were relatively easy to make. As I was unable to choose one, I chose both. 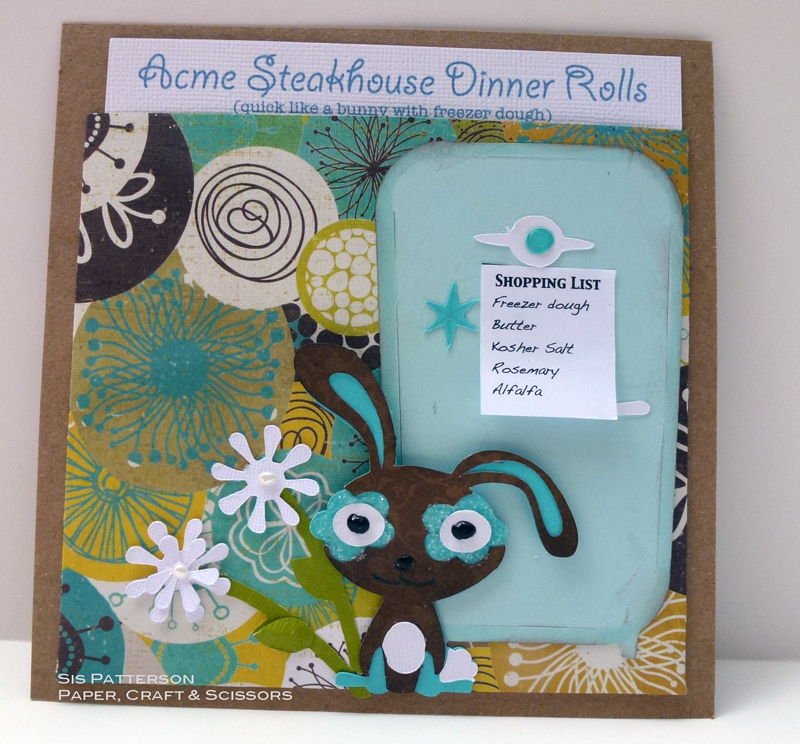 Each recipe is tucked in a pocket on a common piece of kraft cardstock. The fast recipe, Acme Steakhouse Dinner Rolls, uses frozen bread dough or frozen Parker House Rolls. The bunny is from Cricut’s Four Legged Friends, the fridge is “From the Kitchen”, and the flowers are from Flower Shoppe. I typed and printed the shopping list and trimmed it to size. And no, the recipe doesn’t call for alfalfa – it’s on the list for the bunny. And on the other side, the turtle with her dutch oven and a blue and white winner’s flag. 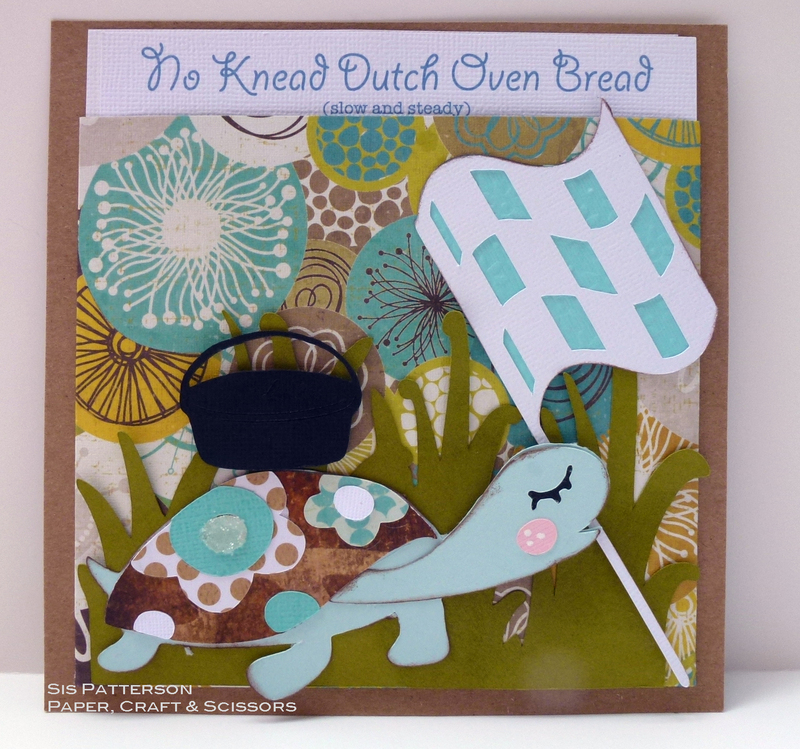 This page features the turtle from Four Legged Friends, the dutch oven from Paper Doll Dress Up, and a Silhouette checkered flag. The grass is from Zoo Balloo. The patterned paper pouch is from Crate Paper and it provided most of the color inspiration for this project. Only two more pages left to create and swap. Next up is sweets. You are just too clever!! The tortoise and the hare recipes and images are just too cute. Can’t wait to see what you come up with for dessert. I’m thinking you should share the recipes too lol. Gorgeous and very very clever :D.
The recipes would be great! What a cool concept! OK, true confession: I was concerned about the alfalfa. hahaha Good to know that it is just for the bunny! Love the colors and the critters!!! Madison says “She went completely above and beyond. That is so clever.” Well, dear, she is only 13 years old, but she has got you figured out. I absolutely LOVE it. The papers are so fun, the colors are fabulous, the list on the fridge is genius. Dang, this cookbook swap is sure lucky to have you. WOW! So stinking adorable! This recipe card is so cool. One moment I like the hare, the next the turtle—back and forth. Your design concept and paper colors are absolutely great! The faces on both make me smile and smiling is a great thing. Thanks for sharing your work with all of us. What a fun swap and these card/pages looks so great love the turtle!! Love the patterns and colors on both of these! Just love the little turtle!